Please note: there was a malfunction of the audio portion of the recording, which could not be detected until after the recording was uploaded to Anna’s page. The sound is choppy. We apologize for this, but hope you will find comfort in viewing the service. Thank you for your understanding. 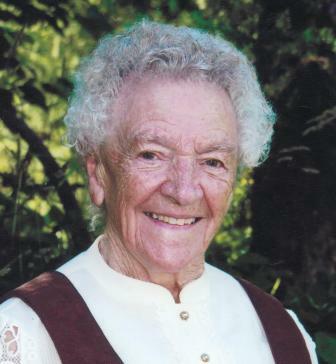 It is with great sadness that we announce the peaceful passing of Anna Erler (nee STEINEGGER) of Clearwater, BC on February 21, 2016 at the age of 97 years. She was a resident of Forest View Place. Anna was predeceased by her loving husband Josef (Joe) Erler in 1980 and by sisters Trudi, Gina and brother Sepp. Anna is lovingly remembered by her family: her son Fred (Sandra) Erler of Clearwater, BC; her daughter Christine (Jens) Reusse of Port McNeill, BC; son Andy (Karen) Erler of Brentwood Bay, BC; by her grandchildren Anne (Chad) Sanderson of Edmonton, AB, Jenni (Ronne) Ludvigson of Nanaimo, BC, Jill (Ryan) Tree of Campbell River, BC, Chris (Barb) Erler of Lethbridge, AB, Mark (Jackie) Erler of Lethbridge, AB, Shauna (Rob) Adams of Stony Plain, AB, Stacey (Ryan) Mazur of Calgary, AB, Sarah (Dylan) Schiewe of Edmonton, AB, and Bradley Geiger of Kamloops, BC; and by her great grandchildren, Lauren, Hailey, Aaden, Reid, Lila, Van, Ashton, Jason, Jenna, Jessa and Kevin. Anna is survived by her sisters Bertha Pollitsch of Austria, Rese (Fritz) Kern of Austria, Mitzi (Josef) Neff of Austria and Frieda Feierl of Austria, and by her nieces Regina Smeja, Renatte (Toni) Heinrich and Rosi Stadler, of Austria. Anna was born in Austria on June 29, 1918 and immigrated to Clearwater in 1952. Anna and Joe raised their family in Clearwater and continued to reside here until their passing. She is remembered as a loving wife, a mother, a grandmother and a great grandmother. Her faith in her Lord Jesus and her love for family and neighbour were exemplified through the life that she lived. She will be dearly missed. Funeral arrangements are being made by North Thompson Funeral Services. A funeral mass will be held at St. James Roman Catholic Church on Saturday, February 27, 2016 at 11:00 AM. followed by interment at Riverview Cemetery in Clearwater. Those wishing to see Anna one more time are invited to a viewing at the North Thompson Funeral Services chapel in Clearwater at 7:00 PM on the evening prior to the funeral. In lieu of flowers, donations may be made to the Dr. Helmcken Memorial Hospital Auxiliary. The family of Anna wishes to express their gratitude to the doctors and nurses who treated Anna, to the homecare workers who looked after her in her home and to the caregivers at Forest View Place who took such loving care of her. Thank you.! Our most sincere condolences to you and all the family on your loss Fritz. We will always remember your dear mother as a kind, loving and giving person. Rest assured that she is seated on the right hand of God’s throne in a place reserved for his most faithful followers.